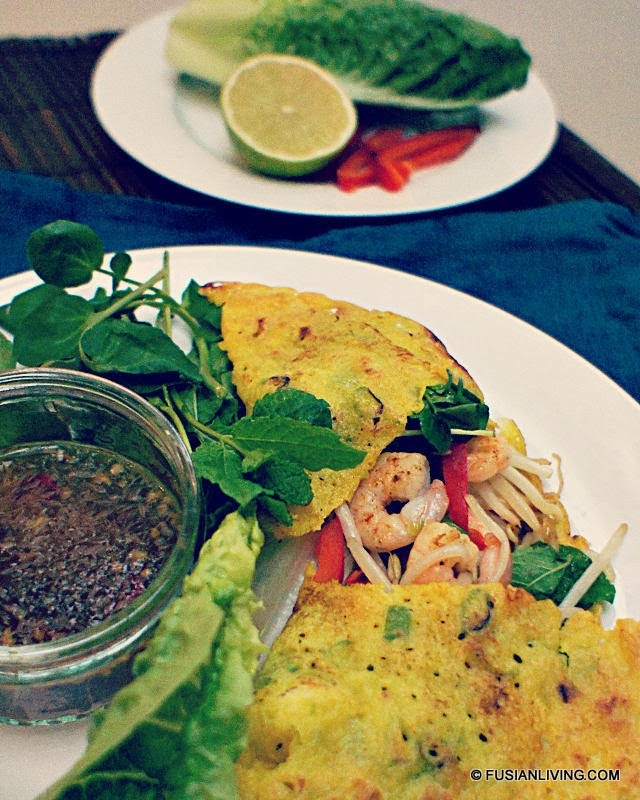 Vietnamese Crispy Coconut Pancakes with Prawns & Fresh Herbs ("Banh Xeo") | Grow Your Own Veg Blog. Gardening and Food Blog. 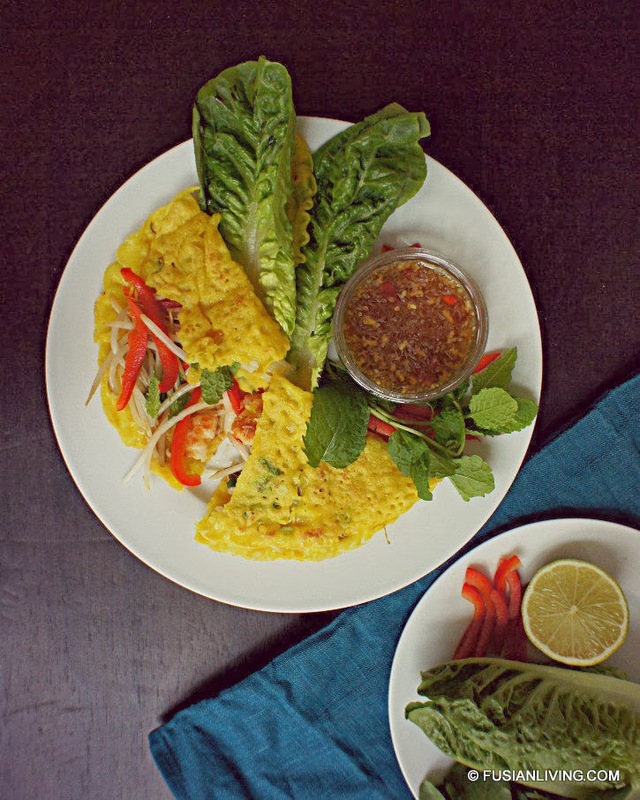 These golden crispy Bánh Xèo are the perfect base for a savoury filling made up of prawns, red peppers and bean sprouts. There are no eggs in this batter, which is made from rice flour and coconut milk. Instead, ground turmeric gives this pancake it's lovely golden colour. Serve the pancake with lettuce of your choice and fresh herbs like mint and watercress. Then, eat it with a tangy dipping sauce made from fish sauce and fresh lime juice. 1. In a bowl, combine rice flour and turmeric, then whisk in the coconut milk, sparkling water and spring onions. Set aside to rest for 30 minutes. 2. Meanwhile, mix together all the dipping sauce ingredients in a serving bowl. 3. Heat 1/2 tablespoon of oil in a pan over medium-high heat. Add prawns and fry for 2-3 minutes, turning them to cook both sides. Set aside. 4. Heat 1 tablespoon of oil in a frying pan over high heat. Add a ladle of the batter into the pan, swirling the pan to form a thin layer. Add a little more batter so the surface of the pan is filled. Cook for 1-2 minutes. Place the cooked prawns, red peppers and bean sprouts onto one half of the pancake. Place a lid over the pan, and cook for a further 1 minute. Remove lid and cook for 1 more minute until pancake is golden brown. Fold over the pancake and place onto serving plate. Repeat using up all the batter mixture. Tip: You can drizzle more oil along the outer edge of the pancake. 5. Serve with lettuce and herbs. Thank you to Sainsbury's for sponsoring this post for Pancake Tuesday, which falls on Tuesday, March 4th, 2014.